Lake George RV Park - Lake George Camping & RV Resort Is Premier Among Adirondack Resorts! How do you know Lake George RV Park is a winner? Lake George RV Park Receives ARVC 2016 National Large Park of the Year Award! National Large Park of the Year Awarded to Lake George RV Park National Association of RV Parks & Campgrounds announces the best-in-class. For the full press release please click here. We are proud to receive the highest rating for another year from the campground inspectors at Good Sam Travel Guide. We are estatic to fall in the top 1% of campgrounds throughout the contry and the only campground in the Lake George, NY region to receive this rating. Lake George RV Park Receives an “A” in the Ninth Annual Consumer Satisfaction Survey of Independent, Privately-Owned Parks! Only 32 campgrounds, RV parks, and resorts across the country earned all “A’s” in the ninth annual GuestReviews™ satisfaction survey of independent parks. Over 30,000 camping and RV enthusiasts completed GuestRated.com reviews, rating their experiences at 2,400 independent RV and campgrounds across the U.S. The Lake George RV Park realizes that many of their guests’ travel with their pets. They have made great strides in providing amenities to also accommodate the 4 legged family members when Charlie’s Bark Park opened in 2014. For the full article click here. 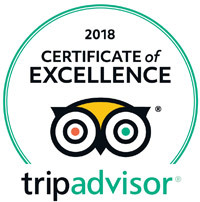 Lake George RV Park Receives Certificate of Excellence Award From TripAdvisor! We are proud to announce that we have been awarded the Certificate of Excellence Award from TripAdvisor. This award is based on the quality of reviews and opinions guests have provided. To leave your own review on TripAdvisor click here. Recognized in the ‘Luxurious Glamping & Beyond’ category, the Lake George RV Park was spotlighted in this CountryLiving article. Lake George RV Park Recognized on the Travel Channel! Long time guests of the Lake George RV Park, the Fendt Family, responded to a survey entitled “What is Your Favorite Campground?” Because of their love for the LGRV Park we were featured on a Travel Channel/Do-It Yourself network episode! Click here to view the full segment. Lake George RV Park has received the coveted Woodall’s Camping Guide’s 5W rating in Recreation and Facilities for 46 years in a row! What does that mean? Our Lake George resort is in the top 100 campgrounds and RV parks in the country. We are the ONLY RV resort in the U.S. that maintained this coveted rating for 46 consecutive years. Contact us for a full media kit.